Eiga Sai is scheduled to run from July 4-13, 2014. Its opening film titled Homeland shows the aftermath of the 2011 Great East Japan Earthquake. Present during the launch were Shangri-La Plaza Marketing Division Head Marline Dualan and Japan Foundation Assistant Director Yukie Mitomi. Eiga Sai, the annual Japanese film festival organized by the Japan Foundation Manila and the Embassy of Japan, sets the spotlight on the value of family with 16 contemporary films which will be shown for free at the Shangri-La Plaza Cineplex this month. The highlights of this year's festival are Homeland and Reunion, which were made in the wake of the Great East Japan Earthquake in March 2011, as well as Like Father, Like Son, a family drama which won the 2013 Cannes Film Festival Jury Prize, as well as two awards at the San Sebastian International Film Festival. 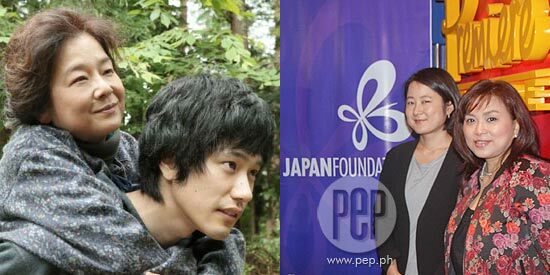 Yukie Mitomi, the assistant director of the Japan Foundation Manila, emphasized the festival's focus on family when she spoke to the press in an interview on June 24. “After 2011, many people in Japan realized the value of family, and so we were determined to choose this theme for this year. It is precisely in times of difficulties when we all come to realize the value of family, and not just the immediate family, but also our extended families, neighbors, and the community,” Mitomi said. Mitomi also admitted that the choice for this year's festival was driven by personal motivation, especially after witnessing similar events in the Philippines, most notably with typhoons Ondoy in 2009 and Yolanda in 2013. “Seeing the scenes of calamities on TV, reading accounts on newspapers, and actually having visited the devastated areas and having listened to experiences of survivors, I felt indeed that this foundation has a lot of things to do to bridge our two countries which share a history of natural disasters,” she said. The festival kicks off on July 3 with Homeland (original title: Ieji), which tells the story of a broken family which reunites in the aftermath of the earthquake in 2011. The film, which was shot entirely in Fukushima Prefecture, was an official selection of the Panorama section in the 64th Berlin International Film Festival. Reunion (Itai asu e no tokakan), on the other hand, shows the immediate effects of the earthquake and tsunami in Iwate Prefecture and how a man engaged in funeral services volunteers to take on the daunting task of preparing corpses for burial and delivering them to their surviving family members. He volunteered to work at the temporary morgue in a high school gymnasium. The family drama Like Father, Like Son is the Japanese take on the John Steinbeck's East of Eden as it questions the definition of a true family. Fly, Dakota, Fly, is a historical drama based on a true incident that occurred after World War II. The documentary film Hearts Together is about keyboardist Grammy Award Winning Bob James and Japanese pop singer Seiko Matsuda as they performed in a charity concert together praying for recovery from the Great East Japan Earthquake. A series of coming-of-age films also await, including A Story of Yonosuke, an official selection of the 2012 Tokyo International Film Festival that’s based on the serialized newspaper novel by Yoshida Shuichi; The Kirishima Thing, a multi-award-winning film adaptation of Asai Ryo’s best-selling novel; and Momoiro sora o, director Kobayashi Keiichi’s debut feature on a high school girl’s journey through adolescence, told through gripping black-and-white cinematography. Multi-awarded film Hospitalité depicts the inevitable transformation of an ordinary family upon the arrival of a visitor, who claims to be from a wealthy family who once provided them with financial support. Comedy film Tug of War! tells the struggles of a women’s tug-of-war team, who want to promote their hometown through sports; while writer-director Yaguchi Shinobu’s award-winning feature, Robo-G, zones in on a consumer electronics company employee’s outrageous plan to pass off a human in a suit as a bipedal robot. Based on the eponymous novel by Naoki Prize-winning author Tsujimura Mizuki, Until the Break of Dawn is a touching story about a young man who becomes a ‘tsunagu’ or an emissary who can reunite the living with the dead. A feature-length adaptation of images from Music ON TV, a music channel, the well-lauded Tamako in Moratorium humorously shows the baby steps of a protagonist lazing around at her father’s home, season after season—until she finds a compelling reason to finally move forward with her life. The drama Casting Blossoms in the Sky by director Obayashi Nobuhiko is about a female reporter who uncovers the people of Nagaoka, a city that overcame numerous wars and disasters. Singer-songwriter Kawashima Ai’s autobiography takes on the big screen in Symphony in August; while celebrated photographer Ishiuchi Miyako’s attention-grabbing exhibit Hiroshima is detailed in the documentary Things Left Behind. Finally, a feature animation by world-class director Hosoda Mamoru, Wolf Children, chronicles 13 years in the lives of a mother and the two children she had with her young lover, a wolf man. These films and 13 more will be shown in Manila at Shang Cineplex Cinema 2 from July 3 to 13, in Davao City at Abreeza Mall Cinema from July 25 to 27 and the FDCP Cinematheque from July 29 to August 3, and in Cebu at Ayala Center Cinema 4 from August 6 to 10.